From the main train station („Hauptbahnhof“) there are several busses going to the Institute of Computer Science (Staudingerweg 9). 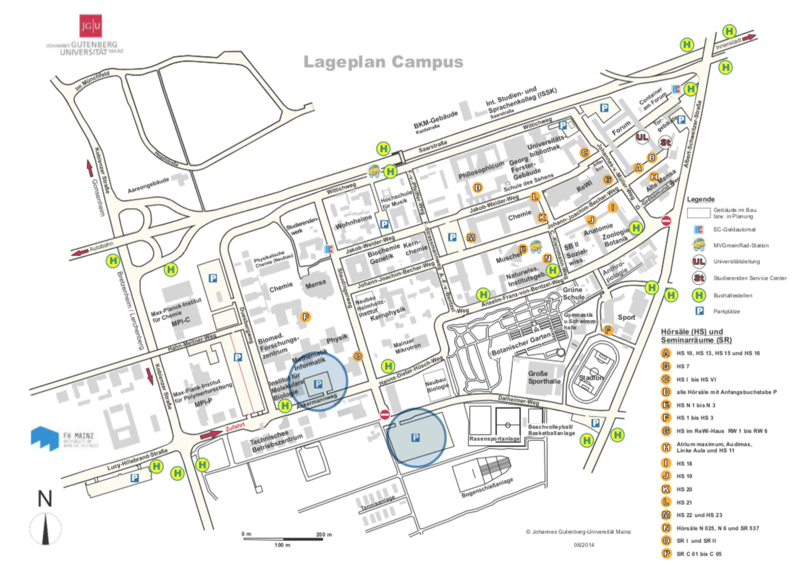 Here you find the location plan of the bus stops at Mainz Main Station. 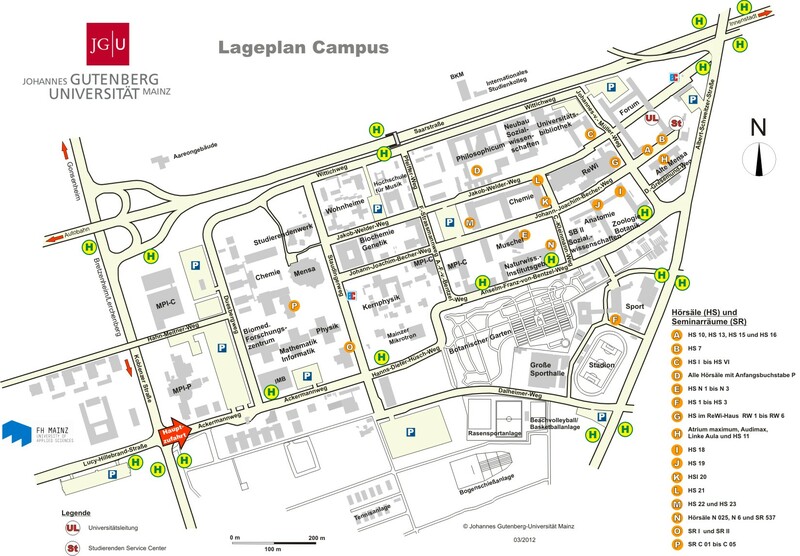 We recommend you to take the bus line 69 (Campus Universität / Kisselberg) from Mainz Main Station to „Staudingerweg“. This bus line runs approx. every 10 minutes. From the bus stop “Staudingerweg” you need another 2-3 minutes to the Institute of Computer Science (Google Maps). The busses that depart from the bus platform G at Mainz Main Station (which is next to the platform of line 69) stop at “Friedrich-von-Pfeiffer-Weg” on the eastern side of the university campus. From there it is an approx. 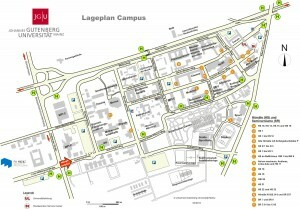 10 minute walk to the Institute of Computer Science situated on the western side of the campus. The Institute is located in the middle of the three cross shaped buildings („Kreuzbauten“) on the third floor. • Travel autobahn A 60 crossing “Autobahn-Dreieck Mainz” direction Darmstadt. • Leave autobahn A 60 at exit “Mainz-Finthen”. • Follow the street sign “Saarstraße/Innenstadt” straight ahead through the traffic circle “Europaplatz”. • Travel autobahn A 60 crossing “Autobahn-Dreieck Rüsselsheim” OR travel autobahn A 63 crossing “Autobahnkreuz Mainz” to get to autobahn A 60 direction Bingen. • At “Schiersteiner Kreuz” change to autobahn A 643 direction Mainz. 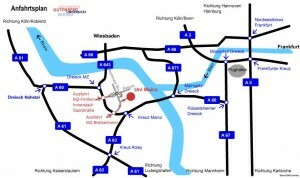 • Follow autobahn A 643 to “Autobahn-Dreieck Mainz” and change here to autobahn A 60 direction Darmstadt. 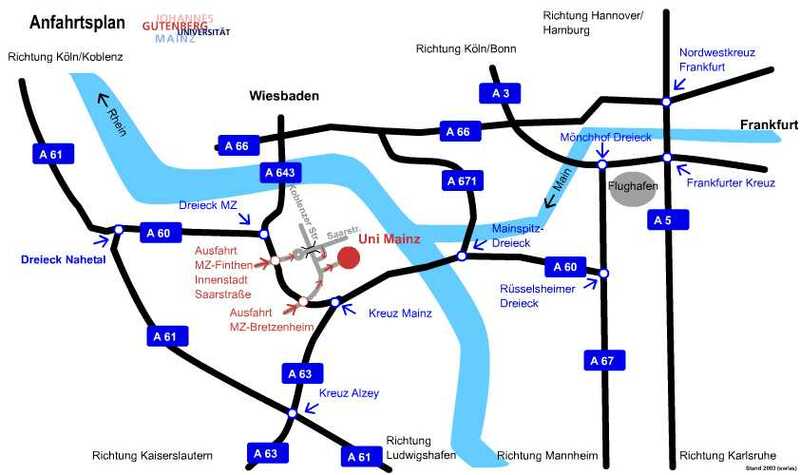 • At “Dreieck Nahetal” change to autobahn A 60 direction Mainz.